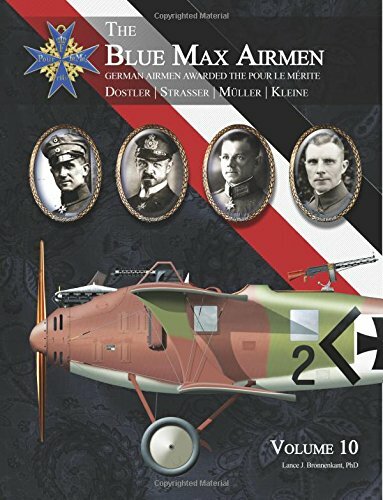 The Blue Max Airmen Volume 10: German Airmen Awarded the Pour le Mérite est le grand livre que vous voulez. Ce beau livre est créé par Lance Bronnenkant PhD. En fait, le livre a 114 pages. The The Blue Max Airmen Volume 10: German Airmen Awarded the Pour le Mérite est libéré par la fabrication de Aeronaut Books. Vous pouvez consulter en ligne avec The Blue Max Airmen Volume 10: German Airmen Awarded the Pour le Mérite étape facile. Toutefois, si vous désirez garder pour ordinateur portable, vous pouvez The Blue Max Airmen Volume 10: German Airmen Awarded the Pour le Mérite sauver maintenant. The Blue Max Airmen series is the real story of the German airmen awarded the Pour le Mérite during the Great War. Author Lance J. Bronnenkant, PhD., and Aeronaut Books are pleased to bring you the most detailed and graphically lavish account of these heroes ever produced, covering the men in context with the war’s chronology of events. For each recipient a comprehensive, well-illustrated biography of the man is given, together with photos of the aircraft he flew, followed by details of his service, including other awards won. Color profiles of the aircraft are also provided for interest to enthusiasts and as references for modelers. Volume 10 covers two fighter aces, Eduard Ritter von Dostler and Max Ritter von Müller, bomber commander Rudolf Kleine, and Leader of Airships Peter Strasser. Volume 10 includes 128 photographs, 10 of them in color, and 7 color profiles of aircraft flown by these men in its 114 pages.